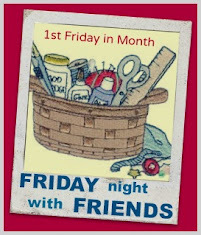 Just a reminder that tonight (well, our time in Oz) is the FNSI….you can sign up over at Heidi’s blog….being Friday the 13th, I’m sure there’s going to be some mayhem going on!!! !…and it will be lucky 13 for someone! Well….I can’t show it all now could I???? That would spoil the surprise! …..designing and making borders for a mystery quilt I started…….oooooh, I think about 10 years ago!!!! !…..now come on……I know it’s not only me that does it………..
……starting two more Market Baguette Bags for a lovely nurse at the hospital who begged and begged till I gave in……I’m a sucker for sob stories…. …but this time, with BLUE handles!!!! not that the waistline needs them but chocolate IS good for the soul! can’t show too much….Raelene may be watching!!! ….and today?????…….vaccuuming!!!! I think it is well overdue! So glad to see someone else's magazine stash look a lot like mine. :0). Keep up all your lovely busy-ness - all good stuff. Vacuuming is SO overrated. *G* I think you have enough going on! I'm drooling over all your magazines girl, imagining how many are Homespuns...I'd move to Australia just for those. Your mystery quilt looks GORGEOUS!!! So much gorgeous work there Wendy. You have been busy. I agree, the magazines must multiply at an alarming rate. You have been busy! Brownies look yummy! Want to come tidy my craft mags? Oh I do love that Tweet Bag..
Yummy and what can be better than quilting and brownies? Stop by my blog and let others know I am giving away some pretty sweet and adorable scissors and miscellaneous fabrics. I am tired just reading the list! Well done -looks great! Friends, swaps and an upcoming competition!